Here’s one for the big and little boys and all girls who love everything that flies too! "The aircraft was flying from RAAF Base Richmond as part of a family day for 37SQN members." Great stuff - everyone is all about family! And, clearly, everyone loves the views you get over Pittwater! There are a few interesting milestones this week concerning our RAAF. First off, our incoming later this year Governor for NSW General David Hurley passed command to Air Chief Marshal Mark Binskin at a parade in Canberra on July 1st this week. The Australian Defence Force has a new Chief after General David Hurley passed command to Air Chief Marshal Mark Binskin at a parade in Canberra. Newly-promoted Air Chief Marshal Binskin paid tribute to General Hurley’s 42 years of distinguished service. “He has been a visionary leader who has always demonstrated the highest level of integrity and values during a time of high operational tempo and challenges for the ADF,” Air Chief Marshal Binskin said. General Hurley thanked the men and women of the ADF for their service and Defence families for their support. “I am always impressed by the passion and professionalism you apply to the work you do at home and abroad. “Despite adversity or danger, when Australia calls on its Defence Force in times of need, our people respond with compassion and capability – that is why we choose to serve and I am immensely proud to have served as the Chief of the Defence Force. I congratulate Air Chief Marshal Binskin and his Command Team on their appointments and wish them well for the future,” General Hurley said. Air Chief Marshal Binskin said he was humbled to be entrusted with command of the ADF. “Thanks to General Hurley’s leadership, I accept command of an Australian Defence Force well poised for the future. My intent is for a Defence Force assured of success at all levels of operations, from humanitarian and disaster response through to high-end warfighting. We must learn from the successes and failures of our past to ensure that we transition as a capable and professional force that is trusted and respected by all Australians and the region,” Air Chief Marshal Binskin said. Air Chief Marshal Binskin's biography is available here. Following the lead of other Commonwealth air forces, during 1955 the RAAF considered replacing the centre of its roundel with a distinctive national emblem. Designs suggested by Mrs Pamela Brinsley, the staff artist at the Department of Air (whose husband was a serving RAAF officer), included the Southern Cross, a boomerang and a sprig of wattle, but eventually the ‘kangaroo in motion’ (as depicted on Australia’s penny coin) was chosen by the Air Board on 8 June 1956 as the most appropriate symbol. The Minister for Air approved the recommendation on this day. Initially the new emblem was displayed only on aircraft fuselages, but in September 1965 the Air Board ordered its use on wings as well. Thirdly 2014 marks the 60th anniversary of the first flight of this gentle slow rumbler of the skies which occurred on August 23rd, 1954. Photo: A C-130H Hercules on the flightline at RAAF Base Richmond displays the commemorative tail marking 50 years of C-130 Hercules service with the Royal Australian Air Force. Photo by LAC Christopher Dickson. © Commonwealth of Australia and RAAF. The C-130 entered service with U.S. in the 1950s, followed by Australia and others. During its years of service, the Hercules family has participated in numerous military, civilian and humanitarian aid operations. The family has the longest continuous production run of any military aircraft in history. In 2007, the C-130 became the fifth aircraft—after the English Electric Canberra, Boeing B-52 Stratofortress, Tupolev Tu-95, and Boeing KC-135 Stratotanker, all designs with various forms of aviation gas turbine powerplants—to mark 50 years of continuous use with its original primary customer, in this case, the United States Air Force. 2008 marked 50 years of continuous use by our own RAAF. The C-130 is also one of the only military aircraft to remain in continuous production for over 50 years. The Royal Australian Air Force (RAAF) is the air force branch of the Australian Defence Force. The RAAF was formed in March 1921. It continues the traditions of the Australian Flying Corps (AFC), which was formed on 22 October 1912. The RAAF has taken part in many of the 20th century's major conflicts including the Second World War, the Korean War and the Vietnam War. More recently the RAAF participated in the 2003 invasion of Iraq and is still involved with the War in Afghanistan. The motto on the RAAF's coat of arms is the Latin phrase Per ardua ad astra, which means "Through Adversity to the Stars"
The Royal Australian Air Force (RAAF) has operated a total of 48 Lockheed C-130 Hercules transport aircraft. The type entered Australian service in December 1958, when No. 36 Squadron accepted the first of twelve C-130As, replacing its venerable Douglas C-47 Dakotas. The acquisition made Australia the first operator of the Hercules after the United States. In 1966 the C-130As were joined by twelve C-130Es, which equipped No. 37 Squadron. The C-130As were replaced by twelve C-130Hs in 1978, and the C-130Es by twelve C-130J Super Hercules in 1999. No. 37 Squadron became the RAAF's sole Hercules operator in 2006, when No. 36 Squadron transferred its C-130Hs prior to converting to Boeing C-17 Globemaster III heavy transports. The C-130Hs were retired in November 2012, leaving the C-130J as the only model in Australian service. The RAAF's first strategic airlifter, the Hercules has frequently been used to deliver disaster relief in Australia and the Pacific region, as well as to support military deployments overseas. The aircraft saw extensive service during the Vietnam War, transporting troops and cargo to South East Asia and undertaking aeromedical evacuation. Nineteen of the RAAF's fleet of twenty four C-130s took part in relief efforts in 1974–75 after Cyclone Tracy struck Darwin. Since then, the Hercules have been involved in humanitarian missions to New Guinea, Ethiopia, Rwanda, Cambodia, Bali, Sumatra, and New Zealand. They have also seen service during the Iranian Revolution in 1979, the Fijian coups in 1987, operations in Somalia in 1993, INTERFET operations in East Timor in 1999–2000, and the wars in Afghanistan and Iraq beginning in 2001. They have also supported the Australian and international community during critical times of need, including in the aftermath of the Bali bombings, air-dropping hay to stranded cattle in regional NSW and responding to the 2004 Boxing Day tsunami. In over fifty years of Australian service, the Hercules have accumulated around 700,000 flying hours. A 37 Squadron C-130H Hercules on approach to land at RAAF Base Richmond. Image by and courtesy 06 November 2008, RAAF Hercules 50th Anniversary Media - The RAAF celebrated 50 years of operating the C-130 Hercules. In November 2008, the RAAF commemorated fifty years of Hercules operation. From that year only C-130Js were deployed to the Middle East. Four of the C-130Hs were placed in reserve at Richmond from 2009. Together with Globemasters, Hercules transported medical staff and equipment to aid victims of the Christchurch earthquake in February 2011. In May 2012 the government announced as part of the 2012–13 Budget that the remaining eight C-130Hs would be withdrawn from service a year earlier than previously scheduled. The aircraft were retired on 30 November that year. Two of the C-130Hs were retained by the Air Force for display at RAAF Museum and for ground training purposes at Richmond; four were donated to the Indonesian Air Force, and the RAAF was reported to be considering options for the disposal of the other six. By the time the C-130H fleet was retired, the twelve aircraft had flown almost 250,000 hours. In April 2013 the Australian government offered to sell five of the C-130Hs as well as spare parts and simulators to Indonesia at below their market value. The Indonesian government accepted this deal, and it was finalised on 26 July 2013. By this time the RAAF's C-130Js had accumulated over 93,000 flying hours. They are expected to remain in service until 2030. From 2015, they will be joined at Richmond by the first of 10 C-27J Spartan battlefield airlifters. Sydneysiders will get one of their last chances to see a Royal Australian Air Force (RAAF) C-130H Hercules in flight, when they fly over Sydney on Monday, 19 November. Two C-130Hs will depart from RAAF Base Richmond in a loose formation at around 10:20am, with one aircraft carrying a bright yellow ‘sunset’ tail art scheme to commemorate the C-130H’s 34 years of proud service to Australia. 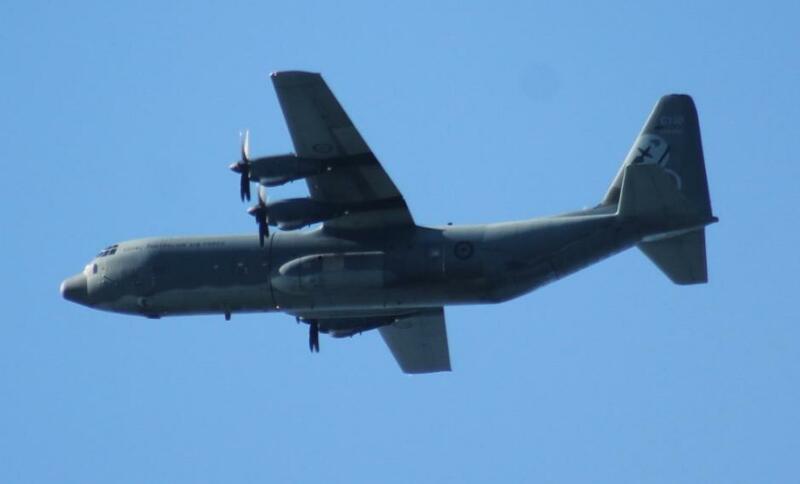 The Hercules will fly from Cronulla along the Southern Beaches at approximately 10:35am at an altitude of 150m, with 600m of separation between the aircraft. The formation will enter Sydney Harbour at 10:45am and climb to 300 metres altitude above all buildings. Both aircraft will orbit Sydney Harbour for up to 20 minutes, allowing members of the media onboard one aircraft to capture imagery of the other. The C-130Hs will then depart Sydney Harbour through the heads, flying up along the Northern Beaches to Barrenjoey Head at approximately 300 metres altitude. From there the aircraft will head west to the Blue Mountains, appearing near Katoomba at approximately 11:25am. Air Force will farewell the C-130H Hercules from service on Friday, 30 November. The Hercules legacy will live on at RAAF Base Richmond as the latest-generation C-130J continues to serve with Air Force. 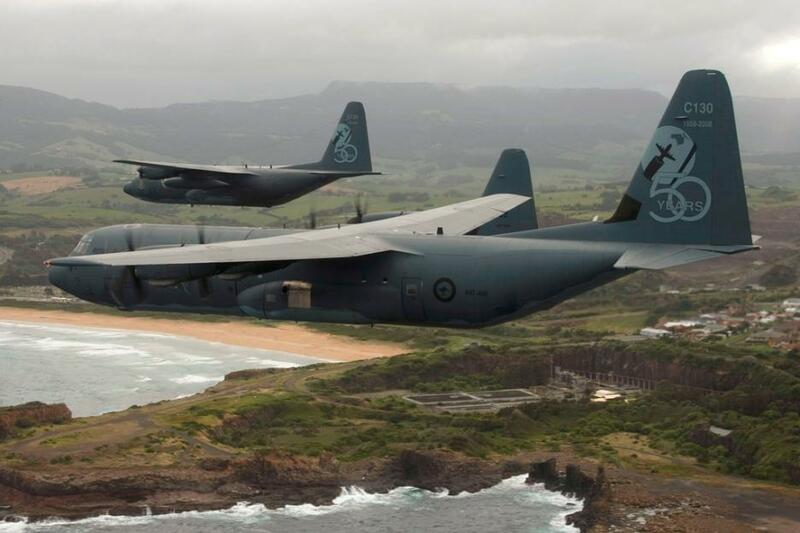 Marking 50 years of service with the Royal Australian Air Force, two C-130J (1 hidden) and a C-130H Hercules fly in formation along the South-East coast of NSW. November 2008 - Photo by LAC Christopher Dickson. © Commonwealth of Australia and RAAF. 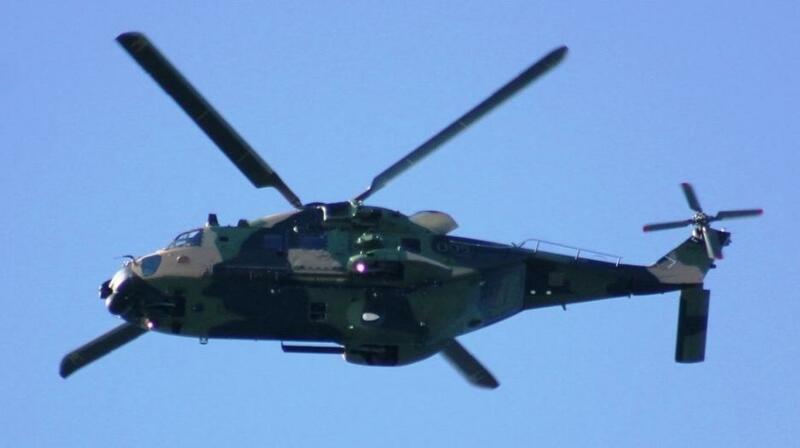 MRH-90 helicopter - specifications - Australian Army Helicopter which flew over just before the Hercules. Our Australian Defence Force (ADF) is conducting training exercise at present in and around the Sydney basin, and also in the Hunter and Shoalhaven regions which commenced Monday June 23rd and shall run until July 15th, 2014. The exercises involve both military personnel and aircraft. While out yesterday we also photographed the above helicopter. By A J Guesdon, 2014.